As surgical methods evolve, new technologies are continuously emerging in an effort to make these methods less invasive, as well as explore new surgical techniques. One such emerging technology is capsule surgery, where a robotic “capsule” is placed inside of the gastrointestinal (GI) tract to perform certain tasks such as exploration, biopsy, therapy, and eventually Natural Orifice Transluminal Endoscopic Surgery (NOTES). Currently available capsule devices are passive (uncontrollable) and can only perform one task; photographing the GI tract. 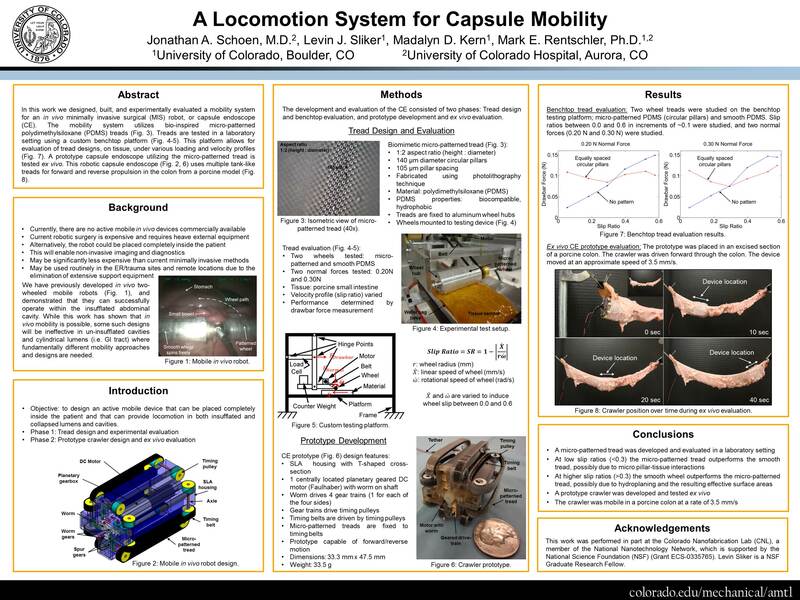 Some work has been done to mobilize the capsule robots using legs, rolling stints, and inch-worm motion. In this work, a locomotion system is demonstrated that can be implemented in a capsule robot design. Building upon this locomotion system, an actively controllable mobile capsule crawler (Figure 1) is being developed for animal testing in the gastrointestinal tract. Micro-patterned treads were fabricated using polydimethylsiloxane (PDMS), a flexible, hydrophobic silicon-based material. These treads feature a three-dimensional micro-pattern on the surface; circular, equally-spaced, pillars with a diameter of 140 µm, a height of 70 µm and spacing (edge-to-edge) of 140 µm. These treads were experimentally tested on a dynamic platform in the laboratory leading to in vivo animal testing. Prior to incorporating these treads into a capsule crawler for the gastrointestinal tract, a simple two-wheeled crawler (one wheel with patterned PDMS treads, and one wheel with smooth PDMS material) was successfully tested in the insufflated porcine peritoneal cavity to demonstrate the effectiveness of micro-patterned treads on tissue. When the two-wheeled robot was placed inside the peritoneal cavity of the porcine model, the micro-patterned tread was able to gain traction on multiple surfaces within the abdomen, including liver, small bowel and stomach; while the smooth wheel generated no traction. The capsule crawler (Figure 1) has been designed to minimize device contact area with the GI tract wall, to reduce frictional drag. The capsule crawler incorporates twelve tank-like micro-patterned treads, powered by two permanent magnet direct current motors, for forward, reverse, left and right locomotion. The device also includes a small CMOS camera for video feedback. A locomotion system for in vivo robot mobility was demonstrated using treads with embedded micro-patterns. The patterned wheel was able to propel a robot within an insufflated porcine peritoneal cavity on small bowel, liver, and stomach. A non-patterned wheel of identical material was unable to mobilize the robot in vivo. The demonstrated locomotion system is now incorporated into a capsule crawler design for evaluation in collapsed lumens, such as the GI tract, of a porcine model. Figure 1. Capsule crawler design.